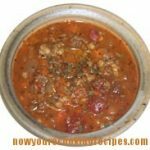 This recipe was once on the back of the Campbell’s Bisque of Tomato soup can, and it is one of my favorites. Sadly, Campbell’s has discontinued Bisque of Tomato soup here in Canada – I think it is still available in the US. I did complain, and they said “sorry” but so far have not reintroduced it! The newer Tomato with Basil and Oregano, or Fiesta Tomato flavours are good in this recipe though. Steak simmered with tomato soup and onions. Pound flour into steak. Cut into serving size pieces. In frying pan, brown steak in oil. Add remaining ingredients, cover and simmer for 1 hour, or until steak is tender. Makes 4 to 6 servings. This is unbelievably good. I’ve made it several times. The first time I made it as directed however, since then, I’ve added chopped vegetables (carrots, celery, onion, or frozen vegetables) and baked it in the oven, covered, at 325 for 2 hours. Then I don’t have to watch over it. I serve it with mashed potatoes — sometime white potatoes, sometimes a mixture of white & sweet. I thicken the vegetable gravy with either potato starch or flour. Leftovers are delicious fashioned into a unique shepherd’s pie. Put the Swiss steak/vegetable/gravy mixture into a casserole, cut beef into small pieces, top this with the leftover mashed potatoes and bake at 350 for 30 minutes. Delicious! Thanks for the great recipe. I give it 5 stars.